This interactive version of the Augmented Gamelan setup was presented at Hackoustic Festival in July 2016. 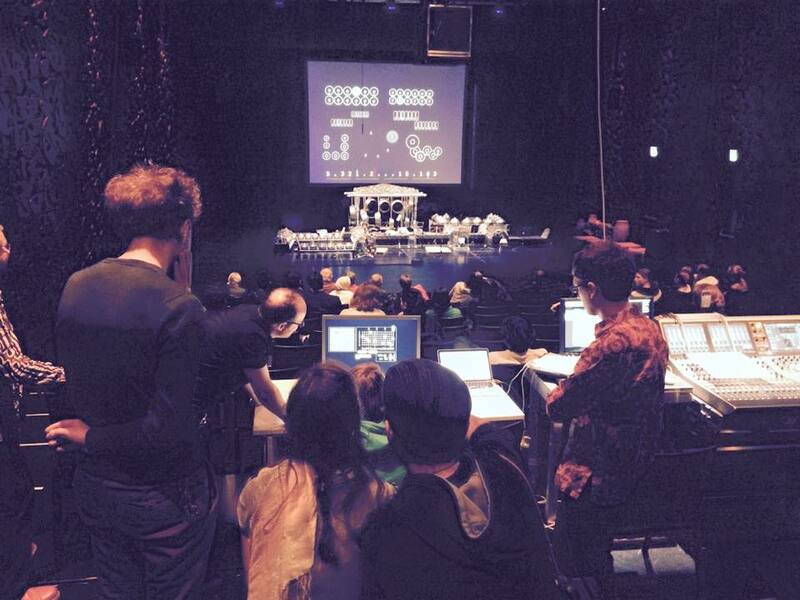 Using a special version of Pipilan (software developed in Max/MSP for composing with gamelan and electronics), visitors were invited to write in sequences to be elaborated upon by a virtual ensemble. 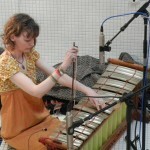 The sequences were translated into sound and light through a set of gamelan instruments equipped with transducers. Pipilan has previously been presented as an installation in EPARM at MUMUTH in 2015. 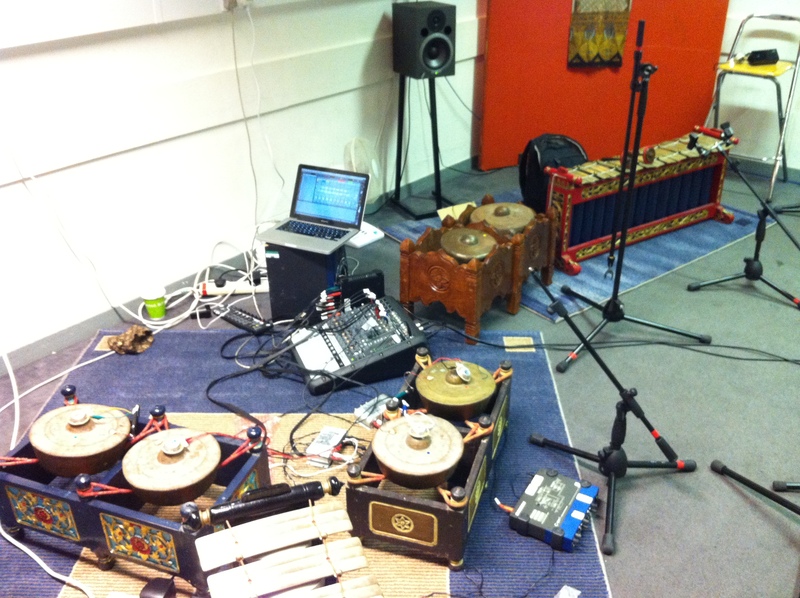 This was the first time the software had been used to control the instruments beyond Augmented Gamelan ensemble performances. We will be performing a new Augmented Gamelan piece as part of a performance with Southbank Gamelan Players and Plaid on the 22nd May. Network explores space around the edges of silence and darkness, and extending the interlocking processes characteristic of gamelan music. Fragments of melody are broken down and rebuilt electronically, passed back and forth between instruments and electronics. Placed in the centre of the ensemble, a set of modified instruments called electric bonang form a bridge between the two worlds. Devices attached to these small gongs turn them into metallic speakers, making them resonate with unique textures and rhythms. This piece centres on a traditional form of Javanese song called Asmarandana, with words taken from the Langendriyan dance drama. In the verses sung tonight, the hero Damarwulan says goodbye to his lover Anjasmara, believing that he will be killed in battle. The first half of the concert will also feature an A/V collaboration with Charlotte Pugh transcribed and updated from improvisation sessions, and works by Augmented Gamelan members Malcolm Milner and Cathy Eastburn (Eternity Bleeps). 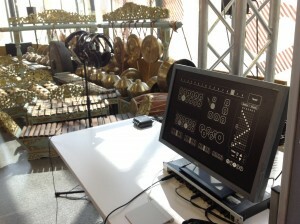 Pipilan is a program for composing with gamelan and electronics (more information here). The software uses a simplified set of rules based on the way musicians work out their parts, allowing users to put in a basic sequence of notes and hear a virtual ensemble respond in real-time. A synthesiser part based on the same principles extends and elaborates the sounds of the instruments. In April 2015 I presented Pipilan as an installation at the invitation of KUG (the University of Music and Performing Arts Graz). 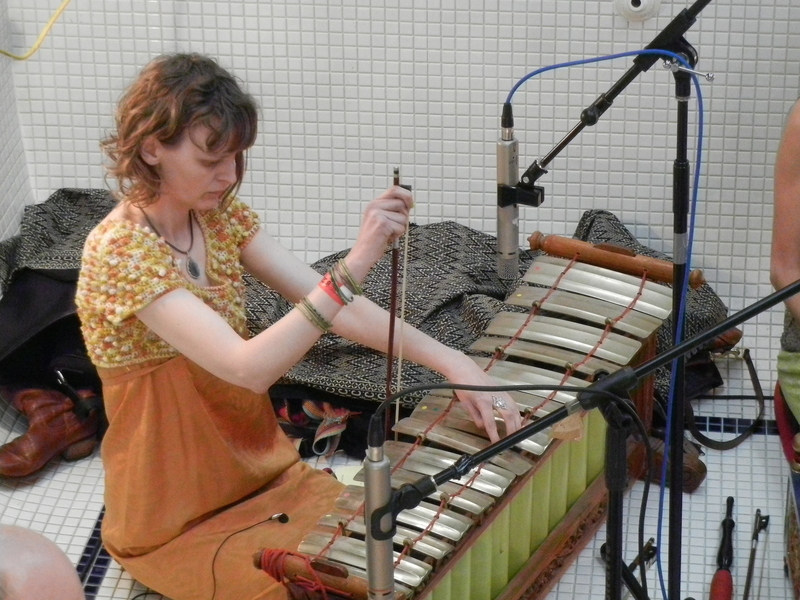 This version was customised to use samples recorded as part of KUG’s own Virtual Gamelan project, and the two projects were displayed side by side. An additional “tweet” button presented the option of sharing compositions on the internet. The installation was also presented as an Ambisonic (surround sound) version in the György-Ligeti-Saal, with audience members collaborating to create a half-hour long piece played over the sound system. This formed the end of a performance of traditional and contemporary music with the Southbank Gamelan Players, and some of the musicians were inspired to play along. I am grateful to Professor Gerd Grupe and KUG for inviting me to share the space with the Virtual Gamelan Graz project, and for providing access to samples of the gamelan. 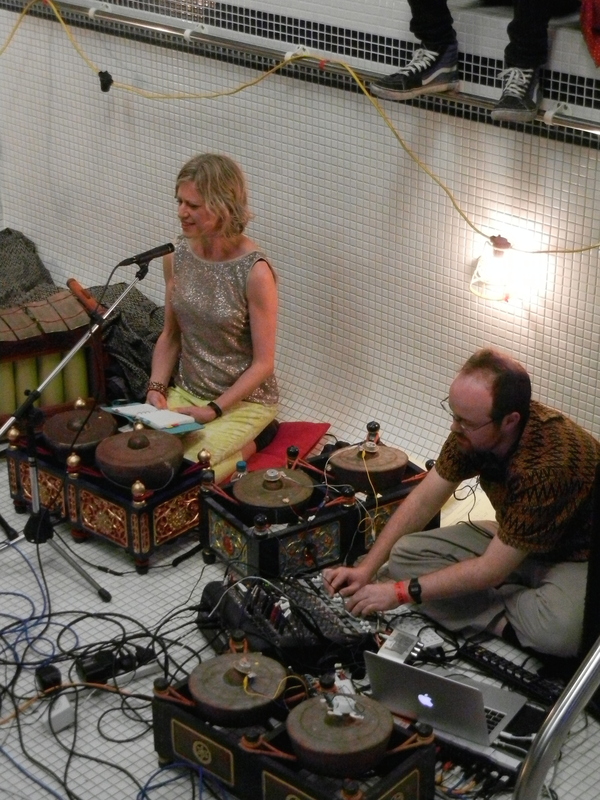 The following recording was made at the No Dark Places festival in June 2013. 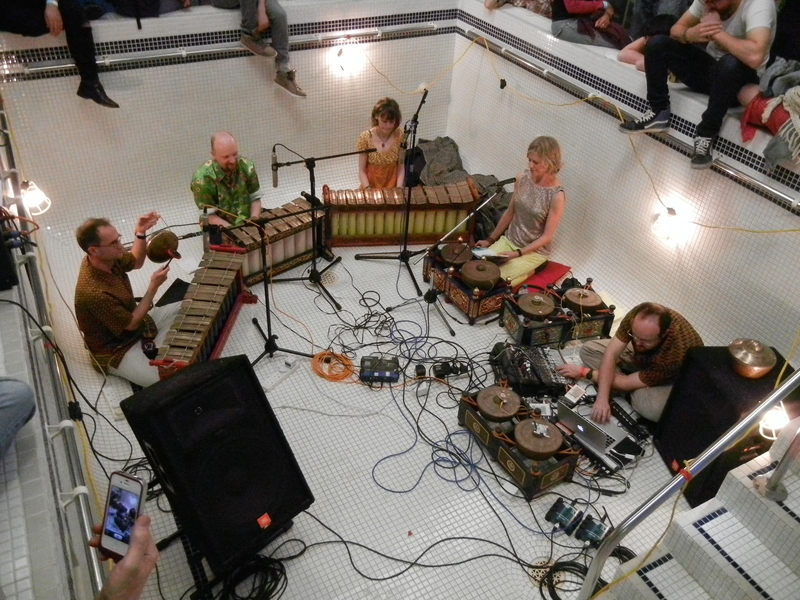 The performance took place in an empty swimming pool. In this set we developed arrangements of traditional Javanese pieces from the Union Chapel alongside new improvised sections. In particular we wanted to play on the intimacy of the venue and the acoustics, introducing a section inspired by Alvin Lucier’s I am Sitting in a Room half way through. 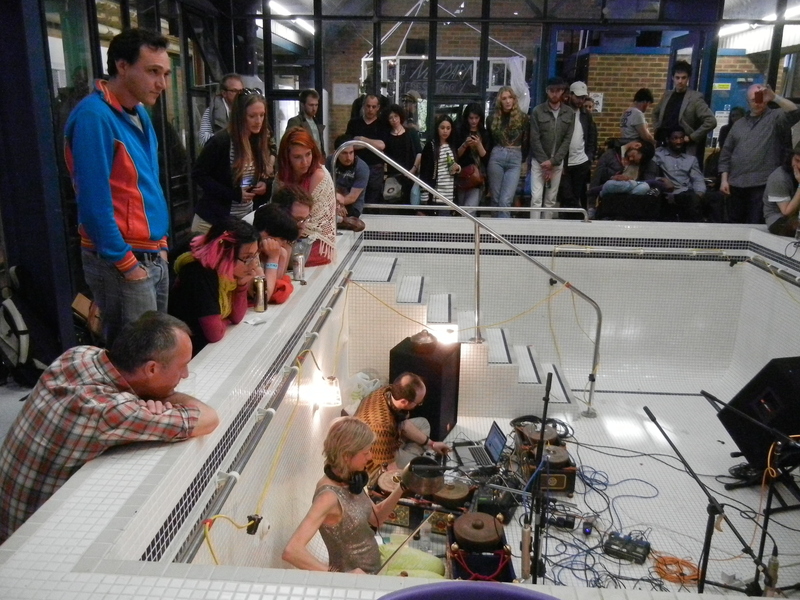 The audience, crowding around the basin, became part of the performance as their spontaneous applause entered an acoustic feedback loop. 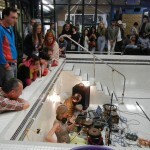 In October I took the electric bonang setup to a Sonic Arts Forum meeting as part of the Sonophilia Festival in Lincoln. 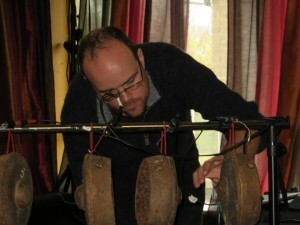 I gave a brief presentation followed by an improvisation using four suspended pencon and transducers. The patch used was created specially for this performance as a continuation of the ideas developed in Solo. The following recording was made at home during development – I hope to have audio/video available from the performance at a later date. A video loop of Response to ShoutCry Room, a multimedia collaboration with Rebecca Woodford-Smith and Oi Nuen Sprunt, is currently on display alongside the original paintings. The Paint and Ink Exhibition runs in the Museum and Bank Negera Malaysia until January 2015. 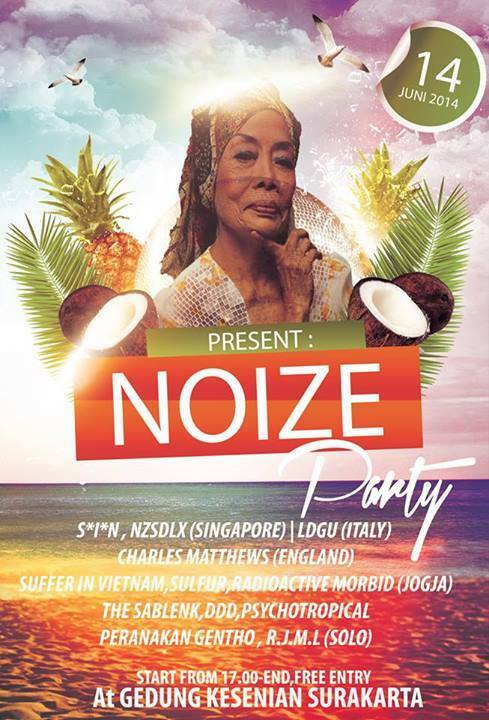 In July 2014 I performed a solo improvisation as part of a noise event in Surakarta. There were twelve acts playing in total. I saw this as a challenge to move away from the more delicate arrangements of traditional material I’ve been working on in recent years. 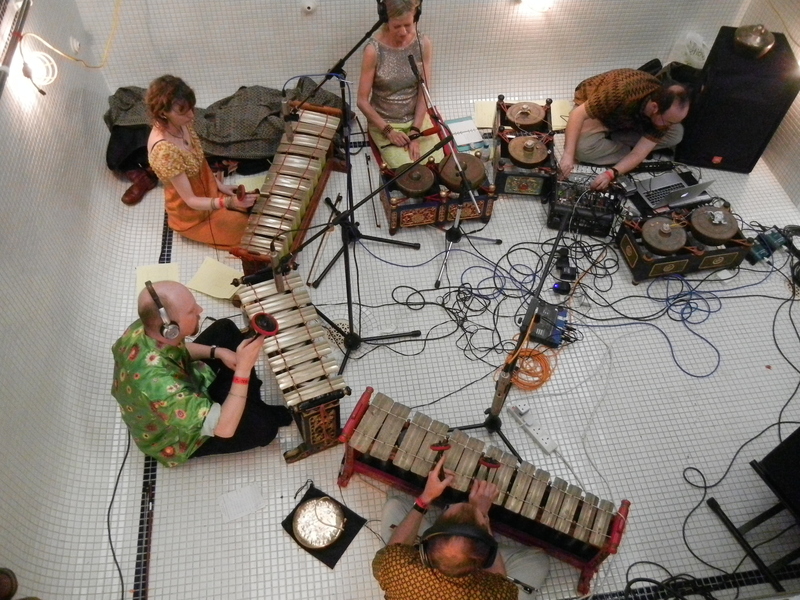 This Saturday 6th July the Augmented Gamelan group will be performing in the front room/bar of the Queen Elizabeth Hall as part of a post-concert gamelan and electronics session. This will follow a performance of a new dance drama (sendratari) choreographed by Matheus Wasi Bantolo and featuring artists from ISI Surakarta and the Southbank Gamelan Players: more information and tickets here. The bar event is due to start around 10:30pm but this may be modified to fit the end of the event in the main hall. It’s worth getting a ticket for the main event but this will not be required for entry to the bar. We will be playing a developed version of the set performed at Daylight Music in the Union Chapel last year and more recently at the No Dark Places Festival, featuring a blend of arrangements of traditional material and free improvisation. 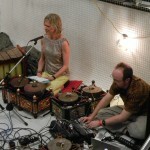 Also performing will be Bitwise + Madek, a gamelan and electronics duo from Galway featuring live instruments. 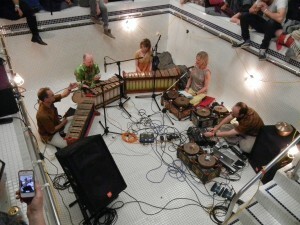 Hear their EP Gamelan Re-imaginings here. A PDF of the full schedule for the weekend can be found here. Response to ShoutCry Room is a multimedia collaboration between myself and performance-maker Rebecca Woodford-Smith, in response to a set of sumi-e paintings and text created by the artist Oi Nuen Sprunt. The performance took place last October as part of an event entitled Art and Healing at the New Diorama theatre in London. Oi Nuen’s paintings were hanging in the space and provided the backdrop for the performance. The full video produced by York Woodford-Smith can be seen on Vimeo below. The sound has been retained from the original mono camera recording to maintain coherence with the images and the space; a direct line recording will be made available later. Since Rebecca and I are currently based in Aberstwyth and London respectively our collaboration primarily took place over the internet over the course of several months, with one rehearsal in the studios at Middlesex University before running through it in the venue on the day of the performance. 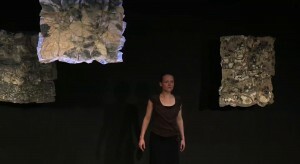 The audio was pre-recorded, but the various channels were mixed to fit the performance space on the day and certain sections were triggered in response to Rebecca’s movements. 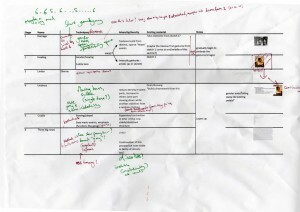 Rebecca’s creative and performance processes are largely linked to embodiment of images and emotional stimuli – what she describes as “finding ways of using the body to give form to memory”. Having started with the paintings and Oi Nuen’s own description of her experience creating them, we worked from a selection of written images, paintings and photographs that Rebecca had chosen as sources to draw on for movement. 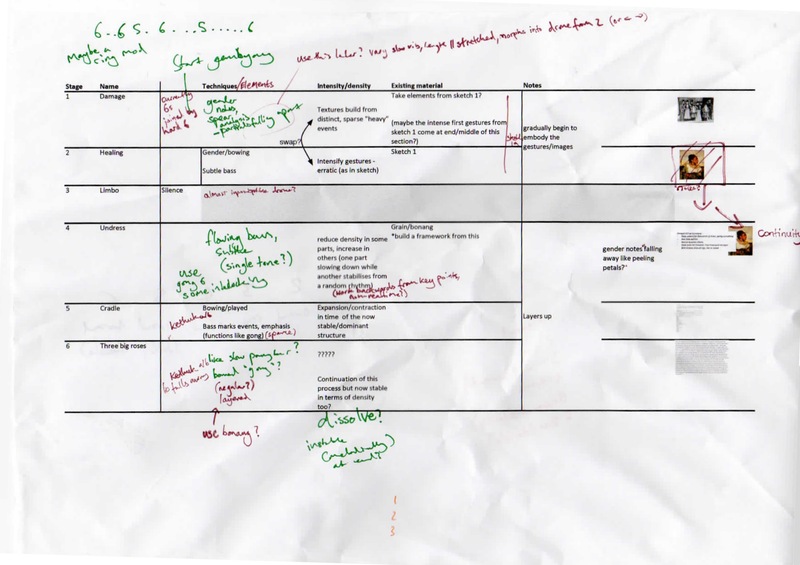 From here I attempted to develop what might be called a more conventional score (an early version of which is pictured below), although our communication largely remained based around verbal discussion. It quickly became apparent that anything along these lines would be more of a guideline or reference point for a more fluid feedback process. 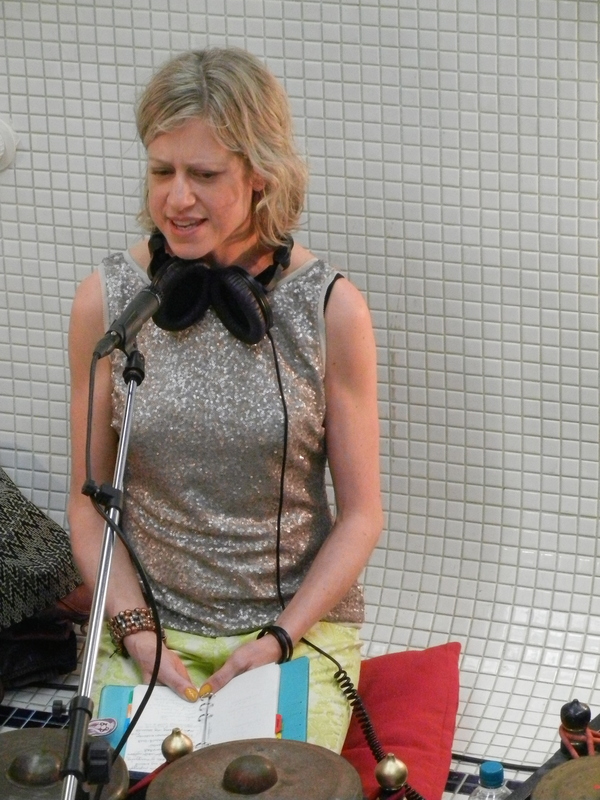 We frequently used the ability to place time-specific comments on SoundCloud to discuss various sections from my audio sketches, which Rebecca worked with independently in her studio space to create the movement. 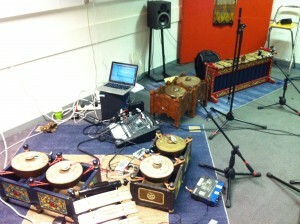 The audio side of the piece was developed using the collection of gendèr and bonang-type instruments I had gathered for the Augmented Gamelan performance in the Union Chapel earlier in the year (pictured below at a recording session at Hampstead Voice and Music Studio), and the composition framework I had been working on called Mipilan. Up until this point I’d been using this setup for arrangements of traditional material, and I’d been finding it difficult to break out of this approach. My own personal aim for this project was to move towards what I could call an original composition, finding ways to integrate non-idiomatic material while maintaining some sort of link with the traditional aesthetic and roles of the instruments. I made a conscious effort to work texturally, spending time trying to deconstruct the sounds of the gendèr with extended bowing techniques and computer processing, in keeping with the given theme of damage and attempting to respond to the images that Rebecca had provided me with. I sent sounds through the bonang using transducers, incorporating the extraneous sounds of traffic and rain into the composition, amplifying them through the resonance of the instruments. This would eventually accompany Rebecca’s movements in the first section, culminating in a spinning gesture set to the clattering of metallic impulses drifting out of phase, slowing to near silence. Chance operations also formed a vital part of the process, initially as a way to move past old habits of referring back to traditional gamelan structures. Some of the sections were created using dice to determine the pace of otherwise fairly regular parts such as the kethuk, which were subsequently elaborated upon using patterns derived from traditional techniques within Mipilan. At times it was impossible to deny the weight of convention; low sine tones formed punctuation for key moments, mimicking the deep beating pulse of a gong in a gamelan that would usually signify the end of a phrase or cycle. Here I tried to explore the borders of the sounds’ established functions, extending them in time, introducing them gradually, and blending them with contrasting bursts of noise that would shoot off into other sections. The foundation for the final part of the piece is based on a traditional structure, inspired by an arrangement of ketawang Pangkur Paripurna that I had stretched out from a couple of minutes to nearly half an hour through extensions of traditional processes. The melodic framework in this section was generated at random through the Mipilan software, which provides a combination of synthesised parts and a guide for instrumental playing. Here the synthesised gongs creep in slowly under a bed of granular textures; key moments are emphasised by bowed gendèr, with differences in tunings juxtaposed to create wavering beating tones. This forms a smooth, stable texture that provides a contrast for the return of erratic physical gestures from the first section and the closing of the performance. This piece represents a shift in approach and aesthetic for me personally; a move away from restrictions of traditional approaches and fear of pastiche to a more integrated approach. With this piece I feel I’ve been able to find a space where I feel equally at home exploring raw sonic texture while dipping into established musical idioms. The experience of working from images and text was quite new to me, although I feel it’s something I’ve often engaged with on a subconscious level. However, by far the most rewarding aspect has been the collaborative process. It was an incredible experience to see Rebecca moving with the sound in rehearsal for the first time, to see life breathed into the gestures and atmospheres that we had been discussing via text. While it would have been interesting to work on the coordination and develop parts in real-time, the long-distance aspect combined with sound communication seemed to afford a certain freedom and integrity to both sides of the work.